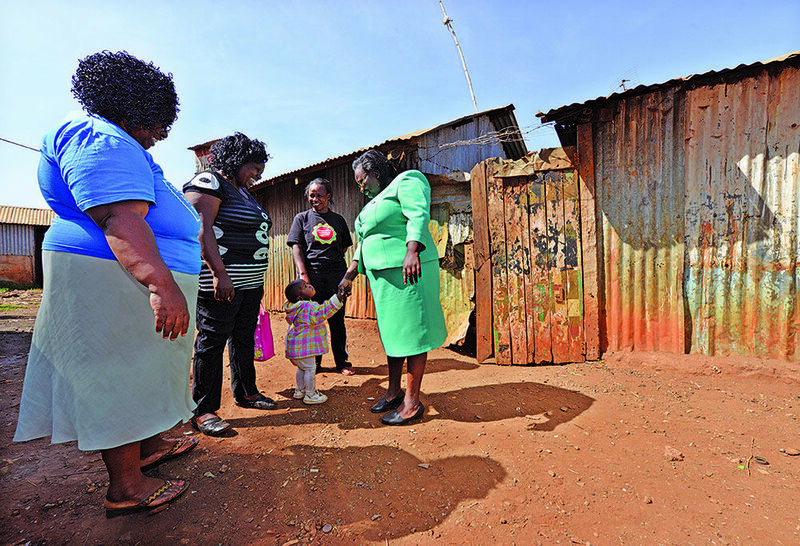 Emmah Kariuki (right), a family planning champion, often visits Kenyan women in their homes to discuss healthy birth spacing. Photos by Tony Karumba. A nurse’s callousness motivated Emmah Kariuki to pursue a compassionate, intrepid style of nursing that has earned her recognition as one of 13 “Heroines of Health” at this year’s World Health Assembly meeting in Geneva. As an adolescent growing up in Kenya, Kariuki experienced painful and prolonged menstruation. A hospital nurse convinced her parents that the 15-year-old wanted to get out of sitting for exams, and she should go to school—even though she was bleeding enough to end up needing a transfusion for anemia. After that experience, Kariuki vowed to realize her childhood dream and set a standard for nursing in her community that exceeded convention and inspired action. A “Heroine of Health,” Emmah Kariuki has a “can do” attitude. Now 49, a wife and mother of two, Kariuki seizes every opportunity to advocate for women in Kenya and empower them with knowledge about reproductive health so they can lead healthier lives at any stage of life. 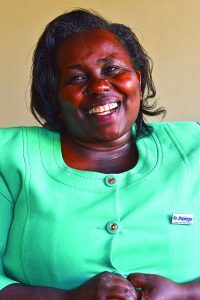 As a nurse educator and trainer for Jhpiego, Kariuki has championed access to family planning and innovated ways to serve women. Notably, while working in an integrated maternal health clinic early in her career, Kariuki discovered that few women knew their HIV status, knowledge that would have a direct impact on the health of an unborn child. She decided to integrate HIV testing and counseling with family planning services. Despite resistance from her colleagues, Kariuki’s change met with success. “Contrary to the belief of my colleagues, we started getting more family planning clients requesting for HIV testing and the numbers started to grow,” Kariuki said. Her desire to improve nursing extends well beyond direct patient care. She is dedicated to innovating training approaches and techniques to build competency and confidence among fellow nurses, midwives and other health care providers. 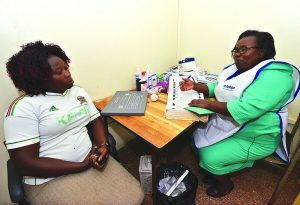 Nurse Emmah Kariuki (right) counsels a woman on available family planning methods including contraceptive implants. For example, when she noticed that the conventional model used for teaching contraceptive implant removal did not accurately simulate the actual removal experience, she experimented with cotton quilt batting as a substitute for the human fascia that surrounds an arm implant to render a truer implant removal experience. This simple, field-driven innovation has been well received by trainees and is being used in other Jhpiego programs and beyond by the Global Implant Removal Task Force. Kariuki’s passion to help women access high-quality health care has not gone unnoticed. “Emmah is a trainer, mentor and passionate worker who puts the common mwananchi [citizen] in the forefront,” says Nurse Manager Florence Kabuga of the Ministry of Health, Nairobi County Government. Kariuki’s can-do attitude also has influenced colleagues to view problems as opportunities in need of positive energy and creative solutions. “She has trailblazed family planning implementation in Kilifi and Nairobi County,” says Christine Muia, program officer, Jhpiego Kenya. While working in the slums of Nairobi, Kariuki met women who wanted to space their pregnancies but lacked information or felt negative pressure from their communities. She saw that young girls and teen mothers were particularly vulnerable. By engaging community leaders in discussion, she opened a door for women to begin to explore ways to educate their partners so together they could plan their families. Sonia Elabd is an editor at Jhpiego; Maryalice Yakutchik is a Senior Communications Manager. Catherine Ndungu, Communications Manager in the Jhpiego Kenya office, also contributed to this article.